If you're going to a building located inside Ortigas Center and you don't know how to get to its exact location, just continue reading and this simple guide will show you the fastest way to get to that building. But first, please check if the building you're heading to is in our list below. Then, patiently read the entire article. The direction to these buildings is written based in the order of their locations along the route. The nearer gets the first direction. The farthest building is mentioned towards the end of the whole direction. If your building destination is not listed below, go to How To Commute From EDSA To Buildings Inside Ortigas Center and Walking Directions From MRT Station To Ortigas Center Buildings. The building you're looking for might be situated in the north part of Ortigas Center. In this article, the third chapter of our series on how to commute to the buildings inside Ortigas Center CBD, you will know how to get to the buildings located to the south of Ortigas Center. The posts How To Commute From EDSA To Buildings Inside Ortigas Center and Walking Directions From MRT Station To Ortigas Center Buildings explain best routes to get to the buildings located to the northern side of Ortigas Center, which are all to the north of Dona Julia Vargas Avenue, the main road that runs through the middle of Ortigas Center from east to west. When you look at the map, you will notice that Dona Julia Vargas Avenue divides Ortigas Center into two parts - north and south. 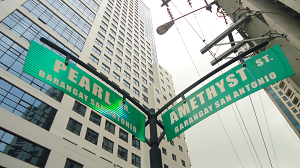 The main road that enters Ortigas Center from south is San Miguel Avenue. It begins in Shaw Boulevard, the main arterial road that bordered Ortigas Center to the south. MRT Shaw Station is situated at the intersection of EDSA and Shaw Boulevard. The distance between Shaw Station and San Miguel Avenue is approximately 500 meters or half a kilometer. The sign of jeepneys that serve commuters going to the buildings located in the southern part of Ortigas Center is "Ugong Tektite". The jeepney is filled up with passengers in its terminal in Mayflower FX and Jeepney Terminal, which is located at Greenfield District, the new development opposite Ortigas Center to the other side of Shaw Boulevard. But if the building of your destination is situated along San Miguel Avenue but nearer to Shaw intersection, there's no need to ride the jeep from Mayflower Terminal. That's because Mayflower Terminal is approximately 450-meter walk from Shaw Station. And you can ride a jeepney right below the MRT-3 Shaw Station, alight at San Miguel Avenue and walk across Shaw Boulevard to get to your destination building. The sign of jeepney that you must ride along Shaw Boulevard near corner EDSA, just a few meters from Shaw Station is "Pasig Palengke". It will pass by San Miguel Avenue. Pay minimum fare. Use the pedestrian overpass to get to San Miguel Avenue. 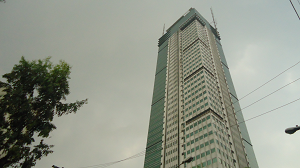 First building situated right at the corner of Shaw Boulevard and San Miguel Avenue is One San Miguel Avenue, a skyscraper with 54 floors and stands 203 meters. It's just across Shaw Boulevard. Next to it is AMA Pasig Campus, followed by Development Academy of the Philippines or DAP. These buildings followed, respectively: Jollibee Center, Hanston Square, Belvedere Tower, and Richmonde Hotel. Buildings beyond Richmonde Hotel are relatively far. So, we go there by jeepney from Mayflower Terminal. To get to the Mayflower Terminal, you must exit MRT Shaw Station at the north exit which goes to the lane of EDSA where buses that pass through are bound for Monumento, Cubao, Fairview, Novaliches, Malanday and Bulacan. Now there are two sides of north exit - Shangri-La Plaza and Pavilion Mall formerly EDSA Central. You must head out to Pavilion Mall/EDSA Central. Here's what you do after getting off the train at Shaw Station. If you get off the train that comes from Taft Station, go towards the rear of the train. If you get off the train that comes from North Station, go towards the front of the train. Use the escalator to exit, go left from the turnstile, then go right after you get out of the ticket booth area, go downstairs to lower level and follow the walkway that links MRT and Pavilion Mall until you get to glass doors with "Greenfield District" signs on both sides. That's Pavilion Mall. Pass through Pavilion Mall, exit at the back, then go to the back of the public market next to an open space covered with green grass. Mayflower Jeepney and FX Terminal is right there at the corner of Mayflower and United streets. Look for a jeepney with "Ugong Tektite" sign. It usually occupies the first jeepney slot so you get to see it quickly. 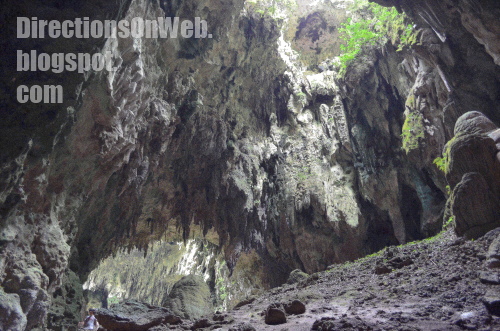 The sign in front should read "Ugong Tektite". If the sign only read "Ugong", confirm to the driver if it will pass by Tektite. Pay minimum fare. From Mayflower Terminal, the jeep goes left on Mayflower Street, then it turns left on Reliance Street and turns left again on Sheridan Street. It passes by TV5 five-hectare Broadcast Complex which is bordered by Pioneer, Reliance, Williams and Sheridan streets. The jeepney then cross Shaw Boulevard to traverse San Miguel Avenue. From the corner of Shaw Boulevard to the corner of Lourdes Street, the jeepney passes by One San Miguel Building, AMA Pasig Campus, DAP or Development Academy of the Philippines, Jollibee Center, Hanston Square, Belvedere and Richmonde Hotel, in that order. Get off the jeepney at the corner of San Miguel Avenue and Lourdes Street if you're going to any of these buildings: Greenrich Mansion, Medico, Manila Luxury, Pearl Plaza, Residencia 8888, The Pearl, University of Asia and the Pacific, PCRDF Building and San Miguel Corporation Head Office. Lourdes Street is the first intersection of San Miguel Avenue from Shaw Boulevard with traffic lights. San Miguel Corporation is situated to the left of San Miguel Avenue. You can also walk from MRT Shaw Station to San Miguel Corporation Entrance located at the back of SM Mega Mall. Watch for separate post coming soon. Medico is situated opposite Richmonde Hotel to the left corner of Lourdes Street. Next to Medico along Lourdes Street is The Pearl. Next building to Richmonde Hotel along Lourdes Street is Greenrich Mansion. Both The Pearl and Greenrich Mansion is situated at both corner of Lourdes Street and Pearl Drive. Go right on Pearl Drive if you're going to Manila Luxury which is next to Greenrich Mansion along Pearl Drive. Go left on Pearl Drive if you're going to Pearl Plaza which is next to The Pearl along Pearl Drive. Next to Pearl Plaza is Residencia 8888. University of Asia and the Pacific is located to the right of Pearl Drive opposite Residencia 8888. PCRDF Building or Philippine Coconut Research and Development Foundation, Inc. is situated to the right of Pearl Drive just opposite the corner of Lourdes Street and Pearl Drive. The jeepney continues along San Miguel Avenue from the corner of Lourdes to the next corner of Exchange Road. Along San Miguel Avenue, the building next to Medico is Medical Plaza Building, followed by OAC or Oriental Assurance Corporation. Next to OAC is The Crescent, followed by Pacific Center, and next to it is Gabriel III. Next to Gabriel III is Linden Suites, followed by OMM Citra Building. Last building in the row is Octagon Center where a big sign of Teleperformance is attached to it. A parking area is situated next to Octagon, next to it Exchange Road. The jeepney turns right onto Exhange Road to get to Tektite Towers. Get off the jeepney before it turns right onto Exchange Road if you're going to either Banker's Center Building or Integrated Bar of the Philippines. Walk along San Miguel Avenue northward and towards main intersection of Dona Julia Vargas Avenue. Banker's Center is situated at the south corner of San Miguel Avenue and Dona Julia Vargas Avenue. Integrated Bar of the Philippines is next to it along Julia Vargas Avenue's south side. 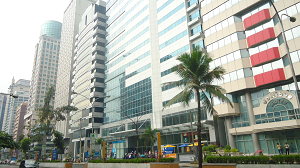 Tektite Towers, home of Philippine Stock Exchange is situated to the right of Exchange Road. It's a twin towers corporate office that also bordered by Pearl Drive to the west. You must get off the jeepney at the corner of Pearl Drive and Exchange Road if you're going to either Pacific Place or Tycoon Building. Pacific Place is to the right of Pearl Drive, exactly located at the corner of Pearl Drive and Amethyst Street, the first street from Exchange Road. Tycoon Building is next to Pacific Place along Pearl Drive. Get off the jeep at the unloading area near the front of Tektite Towers if it's your destination. Exchange Road ends in Meralco Avenue. The jeepney turns right onto Meralco Avenue. If your destination is Benpres Building or Lopez Museum which are situated next to Tektite Towers along Exchange Road, then get off the jeepney before it gets to Meralco Avenue. The tall buildings that you see opposite Benpres to the left of Exchange Road are: The Exchange Regency, situated at the corner of Exchange Road and Meralco Avenue; One Corporate Centre, next to The Exchange Regency along Meralco Avenue and situated at the corner of south corner of Dona Julia Vargas and Meralco Avenue; and Antel Global Corporate Center, next to One Corporate Centre along Julia Vargas south side. Amberland Plaza is a small building along south side of Julia Vargas across parking area in front of Tektite Towers. You can walk to any of these buildings from drop off in front of Tektite or Benpres Building. How to get back to MRT Shaw Station? Go to Meralco Avenue. Walk past Exchange Road towards the direction of all vehicles passing through Meralco Avenue's south lane. All jeepneys that go back to Mayflower Terminal pass through Meralco Avenue-Julia Vargas flyover. So, you must wait for a jeepney at the loading area after the ramp of the flyover. The jeepney sign is "EDSA Crossing". Note: You can ride jeepney that goes directly to MRT Shaw. The sign of these jeepneys is "EDSA Parklea" or EDSA Crossing Ilalim". Commute Map from MRT Shaw to buildings in the south part of Ortigas Center. Please click the red pins. thanks a lot! this is what i was looking for..
@ kayee s, you are welcome. To my readers, kindly plus one me if you don't mind. Thanks for your support. Thanks, it's nice to hear that. ill be working at PSE Center starting next week. i dont even know that Tektite Towers is the other name. Taxi is also expensive from Shaw MRt. thank you very much for this info. You are so welcome. I will appreciate it very much if you "plus 1" me. Just go to http://www.directionsonweb.blogspot.com, then click the "Plus 1" button at the sidebar located right underneath Facebook Like widget. Thank you so much. I really need this guide para di ako maligaw sa manila. @ bagotilyoako, thanks for the visit, good luck sa job hunting. hello.... i was about to apply in center point bldg. as a office staff but i saw in yahoo answer that there's a lot of scam companies in ortigas... is this true?? if you have any idea? @ prince kenn. Nabasa mo na po ba ang buong direction sa itaas? This is great! I really appreciate this. I'm familiar with almost the whole of Manila though I do not know which jeeps to ride. This helps a lot! Thank you! @ Ayame5987vhi. You can ride a jeepney along C-5 with any of these signs: De Castro, EVER Rosario, IPI and Floodway. Alight at Ortigas Ave before or after the jeep turns left (to Ortigas Ave, IPI location). In Origas Ave, ride another jeepney with "EDSA Robinson's Galleria" or "San Juan Greenhills" sign. Alight at EDSA. In EDSA, board a bus with secondary sign "Ibabaw Crossing", don't take "Ilalim Crossing". Alight at Shaw Blvd (Crossing). Walk to Mayflower Jeepney Terminal and ride a jeepney with "Tektite Ugong" sign. Alight at Octagon Center Building. Hope this direction helps you get there. @ Ayame5987vhi. But if I were you, I will ride a jeepney with "Crossing" or "Mayflower" sign. It's faster but you need to walk a bit far. Ask driver to drop you off at unloading area near Tektite Towers. Walk along Exchange Road past Tektite until you get to San Miguel Ave. Go left, you'll immediately see Octagon Center right there. hi.. I'm going to tektite tower and I'll be coming from rosario pasig city.. I really don't know how to go there. can you help me? thanks a lot. Hi im going to West Tower Philippine Stock Exchange Centre, Exchange Road, Ortigas Center Pasig City, im from qc.i dont know how to get there..can you help me?thanks a lot..
@kate. Hello po, dadaan po mismo ang jip na to sa Tektite Tower. Marami po bumababa dun. Mula nman po QC pde kyo tren at baba shaw den follow npo direction na to. @ rodge alcantara. Julia Vargas starts from EDSA. It's the main thoroughfare between Bldg A and Bldg B of SM Mega Mall and it passes through beneath the middle of SM Mega Mall. Since you didn't specify what part of Julia Vargas you are headed, I will give fastest direction to get to the part of Julia Vargas corner EDSA. Take a MRT Train bound for Taft and alight at Ortigas Station. Go to the other side and walk towards SM Mega Mall. Walk further until you get to the wide road perpendicular to EDSA and as I've said passes through the middle part of SM Mega Mall. That's Julia Vargas. If you give me specific building of your destination, I might give you a much quicker direction. @ Dhans Canoy. This jeepney passes by Renaissance Towers which is along Meralco Ave. Please get off the jeepney after it makes the U-turn in Meralco Ave. You will immediately see tall towers of Renaissance. You can also ask the driver. They know it. If you encounter some problem, let me know. Thanks. Hi! It's 2016 now, so I'm just asking again (in case there has been a change). Does this jeepney still pass by Renaissance? Also, the U-turn you've mentioned: is that the one on Meralco X St.Paul intersection? Thanks in advance! Although I can't guarantee, I believe the jeepneys still pass by Renaissance. They are on major route like Baclaran-Monumento so I don't think they will be phased out. Re your second question, I will first double check the landmark, then I'll let you know. @ youdontsay. Take a jeepney with "Pasig" siign and alight at NEDA. Take a jeepney with "MRT Shaw Ilalim" sign, drop off at mrt. Take train to Taft Station. Take a LRT 1 train or jeepney to Gil Puyat aka Buendia. Sir where can i find a jeepney with "MRT SHAW Ilalim" from outside NEDA? San mahahanap jeep na MRT SHAW ILALIM sa tapat ng NEDA? ok thanks! i'll probably take the jeepney. im not a fan of taking trains :)so i should take jeepneys with what signboards exactly? sorry daming tanong. thanks! @ youdontsay. From MRT Taft Station, go to Taft Ave and ride a jeepney with any of these signs: "Divisoria", "Quiapo", "Cubao". Ask driver to drop you off at Buendia corner Taft Ave.
@ youdontsay. Wait for a bus with "Ayala LRT Leveriza" sign at loading area in front of Star Mall (MRT Shaw). Get off the bus right at Buendia Taft. I would just like to ask how I could get to Transcom Pasig/Tiendesitas from Shaw Blvd? @ Cixi. Ride a jeepney bound for Ugong and ask the driver to drop you off at Tiendesitas. Transcom is the big bldg you get to see there. hi! i've just heard this morning that buses coming from batangas are no longer allowed to traverse edsa and are allowed only up to a new terminal in paranaque. can you please tell me how am i suppose to commute from the terminal to julia vargas in ortigas and back(batangas)? i'd appreciate it so much if you could give me a reply asap. thank you! @ babs. You only need to take one bus ride from South West Terminal. Just go to City Bus Terminal in front of Coastal Mall and ride a bus with any of these signs: Monumento Ortigas, Fairview Shaw, Novaliches Cubao, etc. Alight at Mega Mall Bus Bays which is just located at the corner of EDSA and Julia Vargas. The city buses actually pass through Macapagal Blvd and NAIA Rd Ext, the two roads that bounded South West Terminal to west and north, respectively. Hope this guide helps you. oh. okay now i have an idea. but what if i had to specifically go to the one coporate center bldg, what transpo (with what signboards)should i take? also, what transpo can i take to go to the bus terminal in buendia taft except for the mrt :) thanks!!! @ babs. Pkibasa po ang guide kung pano kyo makakapunta sa One Corporate Center. Nakasulat po sa post na eto. Salamat po sa pagbabasa. hi. again :) ive read your post. thanks! ehm, i was just wondering are there buses bound to batangas around the ortigas area? are there buses in sm or robinsons? see, i might be going home late and i just want to make sure i know where the terminals are. sorry i havent been around in the area. also, are buses passing along edsa(bound for cubao) allowed to drop passengers at sm? i think it'll be easier if i ride an fx/jeep at the terminal(sm's) to one corpo. what do you think? id really apreaciate your help. thanks! @ babs. I don't think there are still provincial buses bound for Batangas in Ortigas area and even in SM Mega Mall or Robinson's. As per MMDA's implementation, no provincial buses bound for either Batangas or Cavite are allowed to use or pass through EDSA. Yes, if you are referring to SM Mega Mall, it'll be more convenient to take an UV Express AUV (FX) that will pass by One Corporate Center from Mega Mall. Majority of the city buses that take northbound lane of EDSA (Cubao, Monumento, Novaliches, Fairview, etc) stop at SM Mega Mall bus bays. Always mention to the conductor that your destination is "Mega Mall." if say, i decided to take a bus in the buendia taft terminal, as i've read from one of your previous posts, can i also wait for buses with 'ayala lrt leveriza' signage in front of starmall and get off buendia taft. @ babs. Yes, if you're going to Taft Ave cor Gil Puyat aka Buendia then the sign of bus should be "Ayala LRT Leveriza." They stop in front of Starmall. The provincial buses in terminals there use SLEX routes so I think going there is your best shot. oh wow my other comment wasnt posted. anyway, thank you very much. you've been a great help. last na po, to go to starmall, can i also ride jeepneys with edsa crossing ilalim after the ramp of the meralco-julia vargas flyover or can i ride an fx/jeep back to mega mall? which route will be more convenient? salamat po ng marami!! @ babs. I think depends po sa oras. During rush hour ang tagal makasakay sa Meralco Ave at matagal din bago makarating sa Crossing. Madalas malayo pa ay bababa ng lang mga pasahero at maglalakad ng malayo. If there are lots of UV Express bound for Megamall near your building, go for it (rush hour). Hi! Nu po ang best route ppnta ortigas kming from tayuman area? Mg job hunting po kasi.. thanks! @ gryz. Kung gusto po mabilis pede Lrt to EDSA, then MRT to Shaw Station, then follow directions given above. Kung ang building po na pupuntahan nyo ay malapit naman sa Ortigas Ave, pede baba Ortigas Station at follow directions given sa separate post, or bus to Ortigas Ave at sakay na ng jeepney na "Ortigas Complex - Galleria". Pkibasa po ang separate post para po malaman nyo kung aling route ang mas applicable sa inyo. Maraming salamat sir! Prng my nbsa po ako sa iba n my fx from quiapo. Lam nyo p b yun route nun? Thank you sir! You're a great help! God bless! @ gryz. You are welcome po. Thank you as well. @ Cesar Inocencio. You are welcome. Thank you as well for the appreciation. @ Catherine Vicencio. Sakay po kyo ng bus na may sign na Crossing Ibabaw o kya sakay po MRT to Shaw Station. Then punta npo kyo sa terminal ng jeepney na nakasaad d2. Dadaan npo yun ng Medical Plaza Bldg. Kung nlilito kyo, sakay na lang kyo ng jeepney na "Pasig" ang sign sa kanto ng EDSA at Shaw pero punta kyo sa loading area para hindi mahuli. Sabihin po sa driver na ibaba kyo ng San Miguel Ave. Sa San MIguel Ave, abang po kyo jeepney na "Tektite" at baba npo ng Medical Plaza Bldg. Kung gusto nyo naman para sure ay maglakad na lang kyo sa kahabaan ng San Miguel Ave para nkikita nyo ang mga name ng mga nakahilerang mga bldg. Mabasa nyo naman po ang pangalan ng Medical Plaza, malaki yun at kanan side ng San MIguel Ave. Sana po ay makatulong. @ Catherine Vicencio. You are welcome po. Thank you as well. @ karenheit. Rockwell Business Center is located along Ortigas Ave, left side, next to Meralco complex. You can also use MRT Ortigas Ave Station. Walk to Ortigas Ave and ride a jeepney with "Rosario - San Juan" sign located along Ortigas Avenue near corner of EDSA. If you don't see any jeep, head to its terminal underneath the flyover. Via MRT Shaw, just use Mayflower Terminal or Shaw Blvd, take a jeepney bound for "Antipolo", "Rosario", etc. Just ask the driver if they take Meralco Ave and turn right onto Ortigas Ave. Alight at Meralco complex which is just opposite Meralco Ave, cross Ortigas Ave and walk past Meralco complex, next to it is Rockwell Business Center. On the way back, just take a jeepney with "Crossing Ilalim" sign and alight at EDSA-Crossing where MRT Shaw is located. Hope these directions help you. @ karenheit. Walang anuman. Yun din ang hangarin ko. How to get to Astoria Plaza from Siniloan, Laguna commuting. thanks! @ Archie. Along Shaw Blvd near EDSA, take a "Pasig Palengke" jeepney. Alight at Pioneer cor Shaw, cross Shaw and walk along Pioneer. You will immediately see Astoria Plaza as soon as you get to the end of Pioneer. hi paano po ako mkakapunta sa tektite bldg from antipolo? di ba sakay ng "crossing ilalim" then san po best way na bumaba,? @ cathy09. Pag dumaan po yan Meralco Ave, baba kyo sa unloading na near Tektite den lakad npo kyo. Ask driver's assistance po. @Lag Alag.iba po ba kung sa strata or benpres ako bababa?,mas malayo po ba yun papunta tektite blg? @ cathy09. Benpres po ay kasunod lang ng Tektite. hi paano po pumunta sa jollibee plaza bldg from megamall? @ cathy09. Walk along Julia Vargas left side. Cross ADB Ave, a major intersection with traffic lights. Turn left onto F Ortigas Jr Rd, a perpendicular road to the left of Julia Vargas where pedestrian bridges are located. Walk along F Ortigas Jr past a small park at the left called Ortigas Park until you reach Jollibee Plaza bldg. @ joyce27. Sakay po jeep na 'Antipolo - Edsa' ang ruta. Baba po kyo sa kanto ng Shaw Blvd at San Miguel Ave. Then pkisunod na po ang binigay ko direction sa artikulo na eto pag nasa kanto na kyo ng San Miigel Ave.
Sa likod po n megamall ay san miguel na,tama po b? Walk distance na po b? Crossing ilalim po nasasakyan ko.nalilito po kase ako. @ joyce27. Walk along Julia Vargas, turn right onto San Miguel Ave. Walk at the left side of San Miguel Ave until you see your building destination. Click each red pin in the map above to have an idea of your building location. Hi anu po b best way para makarating ng jolibee plaza from cainta? Sa strata po b? Hi! I would like to ask how to get to this address: Chatime Head Office 8006 Pioneer St Cor United and Brixton Sts Brgy. Kapitolyo, Pasig City. (Landmark: UNILAB/PIONEER CENTER SUPERMARKET). I'll be coming from Calamba. I would also like to know how to get back to Calamba from this place. Thank you so much! Hi! Is it possible to ride a jeepney from MRT-Shaw going to Strata 2000 on Emerald Avenue? TIA! @ reg00. Wait for a jeepney with "Ortigas Complex - Shaw" sign along San Miguel Ave near corner Shaw Blvd. Ask driver to drop you off at your destination. @ Pastel Rhythm. Here's how to get to Pioneer St cor United: Bus to Metro Manila. If Gil Puyat/Buendia Taft Terminal, ride LRT-1 to EDSA Station, then MRT-3 to Shaw Station. In Shaw, go to the inside of Pavilion Mall, exit at United St. Walk along United St all the way past Mayflower and Sheridan streets. Next to Sheridan St is Pioneer. @ joyce27. Jollibee Plaza is at the northern part of Ortigas Center. You may read the other post. If still have problem, ask again. hi paano po pumunta sa San Antonio Village, Gen Atienza Pasig coming from rosario? anu po ba pinakamalapit na landmark? @ joyce27. If the commuter's destination is Gen Atienza, San Antonio Vill, Pasig from Rosario, the jeepney to ride is the one via Ortigas Ave and will turn left onto Meralco Ave. If the jeepney doesn't take Meralco Ave, alight at Meralco Ave and wait for a jeepney that turns left onto Meralco Ave. After the jeepney passed through the flyover of Julia Vargas, alight at the road that goes to PSC Arena. The building at the corner is 808 Bldg. Don't cross Meralco Ave. Instead walk down that road where you alight. Next street is Gen Atienza which is paralleled to Meralco Ave.
hi hello! meron po ba na mga jeep/fx either from rob galleria or megamall na dumadaan sa neda bldg/ua&p? and from there how would you commute sa civil service com office sa may panay ave? THANKS! @ Anon. If from Robinson's Galleria, you need to go to the other end. Cross ADB Ave. Wait for a jeepney with "Shaw Blvd" sign at the corner of Garnet Rd and ADB Ave. But I have to remind that you have to be patient as it takes long before the jeepney arrives. Get off near NEDA and walk your way. To second destination, ride jeepney to Shaw, take MRT to Quezon Ave. Take a trike to Civil Service. Trike Terminal is located between McDo and KFC, that's Panay Ave.
okay. thank you lag alag! paano po mag di ako mrt? may fx ba sa may ortigas na pwede magbaba sa may malapit sa may panay ave? yung mga fx na pa sm north kaya? sorry wala po akong alam sa route na to. thank you! @ Anon. Before you ride the fx to SM North, ask the driver if he can drop you off at Centris, then cross EDSA via MRT station there and go to the trike terminal. You can also walk down Panay Ave, cross the next intersection, Civil Service is on your right, very near to EDSA actually. @ jerome banda. You can take jeepney to Cubao in front of St Luke. In EDSA southbound, take a bus with secondary sign that reads "Crossing Ibabaw" then follow the direction given in this article. You can also take a bus with "Ortigas Ilalim" sign then follow direction to Tektite from Ortigas cor EDSA in the separate post entitled How to Commute from EDSA to Buildings inside Ortigas Center. @ jerome banda. You are welcome. @ kiel willas. Here's a fast route. From Las Pinas, take a bus via Coastal Road and quickly get off at Coastal Mall or even in Roxas Blvd Baclaran area where you will take a city bus that takes EDSA, e.g., "Monumento", "Cubao", "Fairview" etc. There must be a secondary sign in front of the bus that reads "Crossing Ibabaw/Shaw." Alight at Shaw Blvd. Walk to the jeepney terminal mentioned here then follow the direction. Alternatively, you can use MRT from Taft to Shaw Station. Note: For details on how to locate the jeepney terminal from Shaw Station, please read the article as it is mentioned here. @ renardjhay tongco. Hindi ako sigurado kung neron ng UV Express sa ganun kaaga oras. Pero hayaan po ninyo pag nagkaron ako ng pagkaktaon na malaman ay isusulat ko d2. Does the Fx/jeep terminal still exist in Mayflower street or has it moved? I dont see one. Thank you! No more terminal there. I will update this post, soon. To all, please be informed that as I had said earlier, this post is now updated, just today. You will find the update about terminals of jeepneys and vans going to the buildings listed here within the post. So, if your building destination is on the list, just read the whole directional article. Many thanks to you all. Hello! Walking distance lang po ba yung Tycoon Building from Shaw Blvd? Nakarating na po kasi ako ng San Miguel ave sa may Richmonde Hotel and yung sa red dots sa pic ay magkalapit lang ang Richmonde and tycoon building. Thanks po. Once you're already in Richmonde just walk further to get to Tycoon, thanks.